NEW YORK, NY – January 19, 2016 – GROHE is returning to the show floor of KBIS, promising to wow with its newest products for kitchens and baths. The assortment of newcomer offerings includes first-to-market innovations, aesthetic achievements, and superior user experiences. The designs will be found in the company’s KBIS Booth #S8041 at the Las Vegas Convention Center, January 19-21, 2016. Leading the parade of smart introductions is the LadyLux3 Café kitchen faucet featuring Foot Control Technology, which allows the user to easily switch the water flow on and off with a tap of the foot on the activation plate installed discreetly in the toe space of the cabinet. The inventive product frees both hands for added maneuverability in the kitchen. 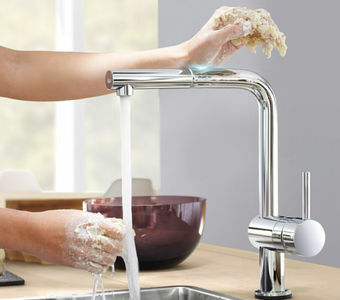 Because the need to operate the faucet via the handle is eliminated, the faucet remains clean and bacteria-free. Another smart solution for the kitchen: the Minta™ Touch Generation 2 faucet, which impresses homeowners with its EasyTouch technology. The clever coup intuitively reacts to the user’s touch, whether it is the back of a hand or wrist, to eliminate the spread of germs. New innovations from GROHE are also set to transform the bathroom with the launch of F-Digital Deluxe, a shower system that ushers in a new era of bathing experiences. The modern marvel transforms the shower into a home spa by providing multi-sensory experiences via light, sound, and steam. The light module uses colored lights to change the ambience of the shower—the user can change the color and intensity of the light to suit the desired mood. The system also enables its user to stream a favorite tunes from an iPhone® or Android® device, meaning the shower can become the ideal spot to rev up for—or relax after—a big day. What’s more, steam can be added to the experience, allowing the bather to detoxify and indulge in a completely sumptuous experience. The F-Digital Deluxe system is scalable: the homeowner can specify a combination of showerheads according to the size of the shower space. Rainshower “F” series ceiling showerheads feature advanced shower engines to deliver precise water distribution throughout any spray pattern, and body spray units double as shower heads to provide an immersive water experience that promotes physical and emotional wellbeing. 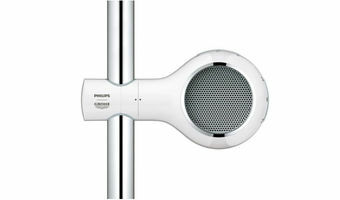 For those looking for a simpler way to add music to the shower experience, GROHE teamed up with Philips to introduce Aquatunes: a waterproof Bluetooth® speaker that serves up expert audio engineering with premium bathroom design. 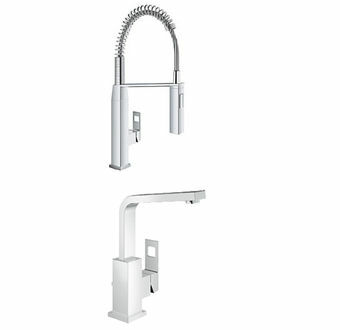 Two of GROHE’s newest faucet collections—Essence New and Eurocube—have models for both the kitchen and the bath, allowing for a continuity of aesthetic throughout the home. The design of the Essence New line offers improved functionality and a crisp, clean appearance in a variety of sizes. The S model is available with either a straight or curved spout—the size is also the slimmest GROHE basin mixer, thanks to its new 28mm SilkMove® cartridge. The M, L and XL models feature a swivel spout that can be set for an optional 90- or 360-degree swivel for enhanced maneuverability at the sink. For the bathroom, the Essence New floor-standing tub filler is equipped with a hand shower, providing the user the option of a luxurious soak or shower experience. 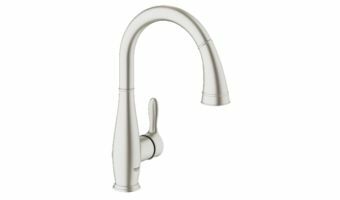 The Essence New kitchen faucet features a pull-out dual spray with toggle function that allows for seamless switching between spray and regular water flow. Recently launched with a kitchen model, the Eurocube suite is expanding with several options for the bathroom—faucets in various heights to accommodate any sink application. Inspired by the contemporary architecture of European cities, the distinctively cubist faucets feature clean lines and geometric styling, an ideal option for today’s cosmopolitan consumers. Across the range, cut-out detailing on the lever handles highlight the unique square design of the collection. Eurocube faucets also feature GROHE SilkMove® 35mm cartridge for a lifetime of smooth operation and integrated adjustable temperature limiter to prevent scalding. An elegant line of bathroom faucets, the Eurostyle collection is praised for its organic design and accessible price point. 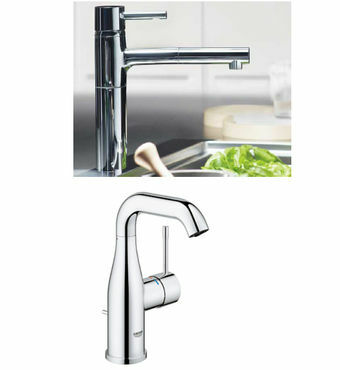 The faucets are available in S or L sizes, both sure to turn heads with their attractive, sculptural shapes. 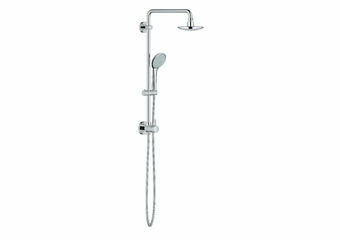 GROHE is also debuting a new iteration of one of its best-sellers: the 18” GROHE Retro-Fit™ with standard shower arm. The product transforms an existing shower into a luxurious shower system with a showerhead and hand shower quickly and easily—without breaking the wall—to update the bathroom in one hour or less. The new model, a smaller version of the popular 25” model, offers a solution for homeowners that have limited space in their shower application. A new, on-trend look is coming to the Grandera collection of faucets and fixtures with the introduction of Rose Gold finish. 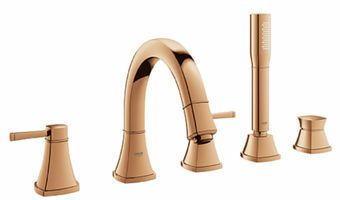 With Rose Gold, Grandera—one of GROHE’s most popular lines with design options that run from traditional to contemporary—continues elevate its spaces with one of the today’s most decidedly luxe finishes. 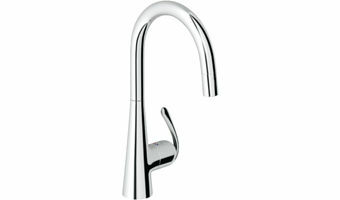 The new Parkfield kitchen faucet offers a tactile experience with a rounded lever and curved body. Ease of use is at the heart of the product with a pull-out spray with locking feature that lets the user switch easily between two spray modes—perfect for rinsing the sink 5 or washing vegetables. 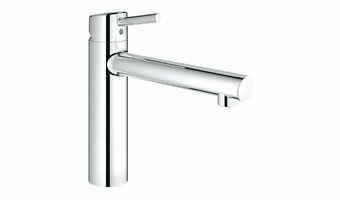 The faucet is a winning combination of good looks, comfort and flexibility. GROHE faucet and shower products are distributed in more than 180 countries and represent nearly 80 years of excellence in European design, innovation, engineering and quality. GROHE America’s headquarters are in the heart of the Flatiron district and houses the GROHE Live! Center, an interactive showroom created for inspiration and collaboration. The GROHE Group is the world’s leading provider of sanitary fittings, comprising Grohe AG, Hemer, Hamburg and other subsidiaries in foreign markets. With its global GROHE brand, the GROHE Group relies on its brand values quality, technology, design and responsibility to deliver “Pure Freude an Wasser”. The GROHE Group was purchased by the LIXIL Group and the Development Bank of Japan in January 2014. The LIXIL Group is the global leader in the building materials and housing equipment industry.